Aluminum medium sized pair of left and right turn fins for a deep vee or mono hull. The mounting brackets on these make them very adjustable. They can be moved up and down or tilted into or away from the transom. 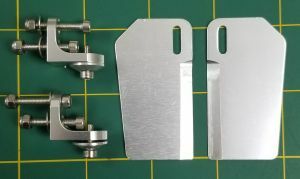 Brackets constructed of aluminum. These come with everything in the picture, plus some basic mounting bolts and nuts.